New India Assurance Company Limited (NIACL) Recruitment 2018 : NACL Recruitment notificcation is out for filling up various vacancies. 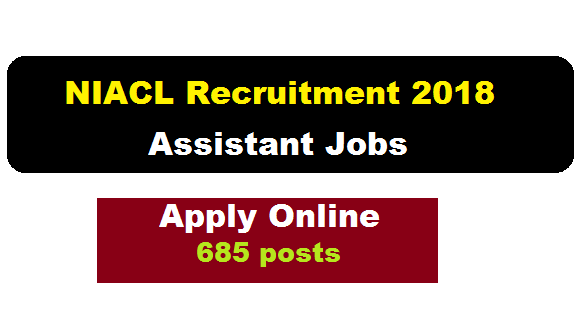 According to the latest NIACL Recruitment 2018, Online Applications are invited from Indian Citizens for recruitment of following posts of Assistants in New India Assurance Company Limited (NIACL), A Government of India Undertaking having its headquarter at Fort, Mumbai. In this section, we will discus in detail about Recruitment of Assistants Under NIACL Recruitment 2018 with all the details and requirements. Educational Qualification : Candidates must be Graduate from a recognised University / equivalent. Knowledge of Regional Language of the State of Recruitment is essential. Age Limit : 18-30 years as on 30/06/2018. Recruitment by Tier-I Written Test (Preliminary) on 08/09/2018 and 09/09/2018 followed by Tier-II Examination (Main) on 06/10/2018 for selected candidates. Interested and eligible candidates may apply online at New India Assurance website from 16/07/2018 to 31/07/2018 only. 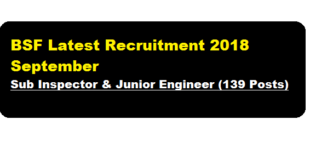 According to the latest Border Security Force Recruitment 2018 September , Border Security Force (BSF) invites applications from Indian citizens for appointment of Sub Inspector & Junior Engineer posts exclusively for Engineering Diploma holders . The details of the vacancy are discussed below.